Many series, even hits, start showing their age around their sixth season, as original producers and supporting cast members start looking elsewhere for work. 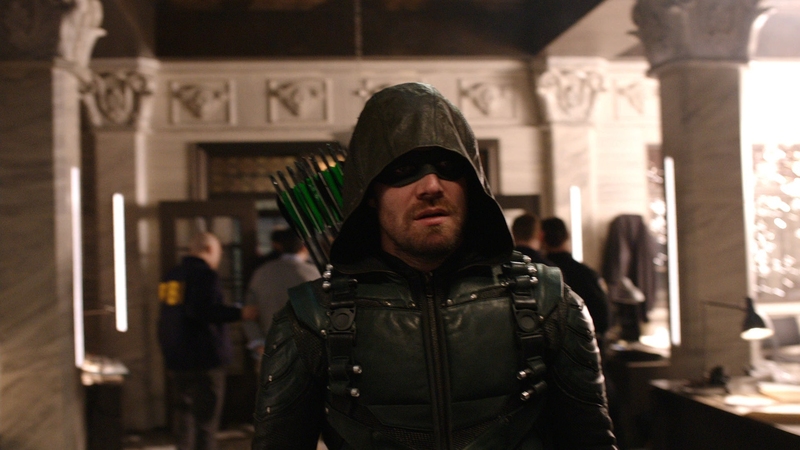 Most die-hard Arrow fans found the fifth season to be a real return to form for the DC show that first started this current wave of superhero television. The DC shows keep expanding on the CW’s schedule. Some have questioned that rapid expansion possibly diluting the quality of each series. The newfound energy and enthusiasm from last season somewhat returns in this solid sixth season of Arrow, seeing the rise of new villains and the return of a beloved favorite, Deathstroke. 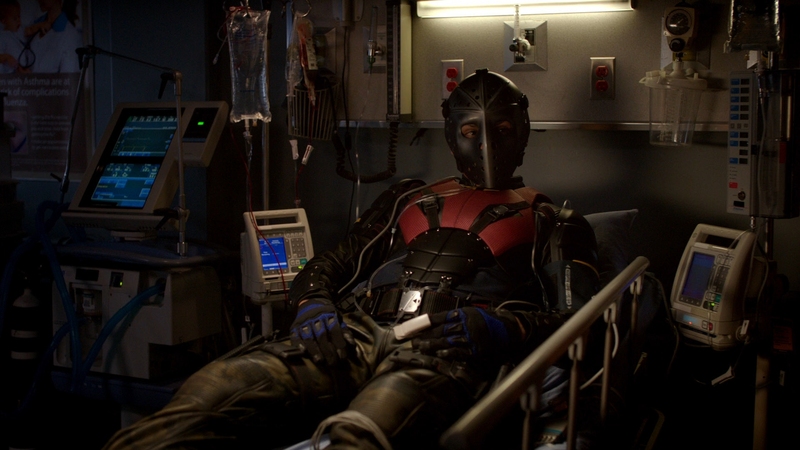 Recalling the best moments in Arrow’s history, learning Deathstroke’s backstory is immensely satisfying after his long absence from the show. Depending on how you feel about the character, the return of Katie Cassidy as a series regular in the form of Black Siren, Laurel’s evil double from another Earth, feels like Arrow going back to its roots. It is inevitable that a long-running show like Arrow hits a few bumps along the way in a long season. Thankfully there are no disastrous creative choices that sink the characters or the recurring story-lines. The villains pose credible threats and Oliver is under tremendous pressure all season to keep his secret identity from being exposed. 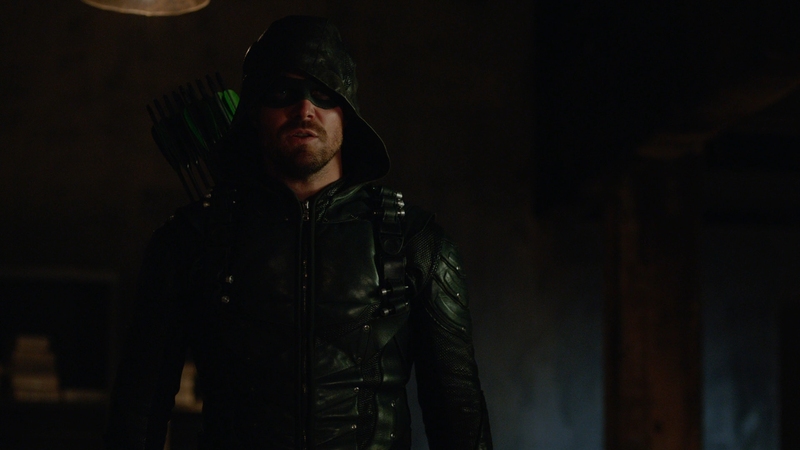 Green Arrow has new challenges to face in season six, including serious strife within Team Arrow. Gone is Adrian Chase, the man that made season five so electrifying. In this season Oliver Queen (Stephen Amell) has to juggle being Star City’s mayor, protecting the city from criminal mastermind Cayden James (Michael Emerson of Lost fame), keeping his team of vigilante heroes together, and being a dad to William after the events of last season. 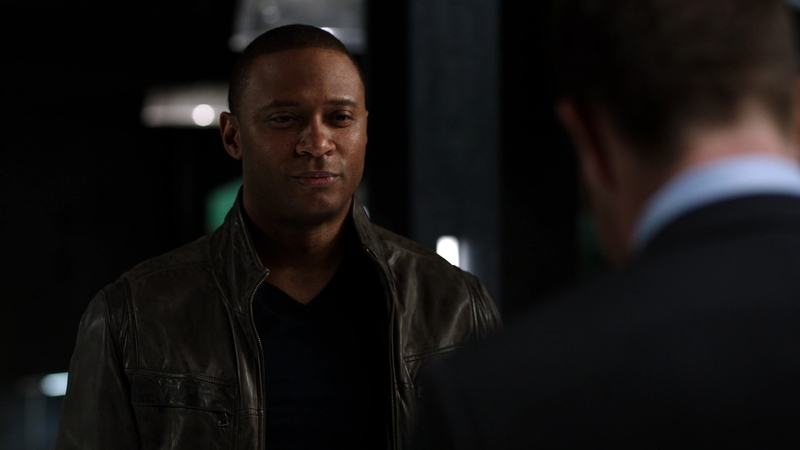 Returning characters include Felicity, Diggle, Quentin Lance and Curtis (Mr. Terrific), not to mention newer characters like Rene (Wild Dog) and Dinah Drake (Black Canary II). It’s a wild ride with roller-coaster twists and turns all season long. You can tell Arrow’s producers kept an eye on the news when writing this season. 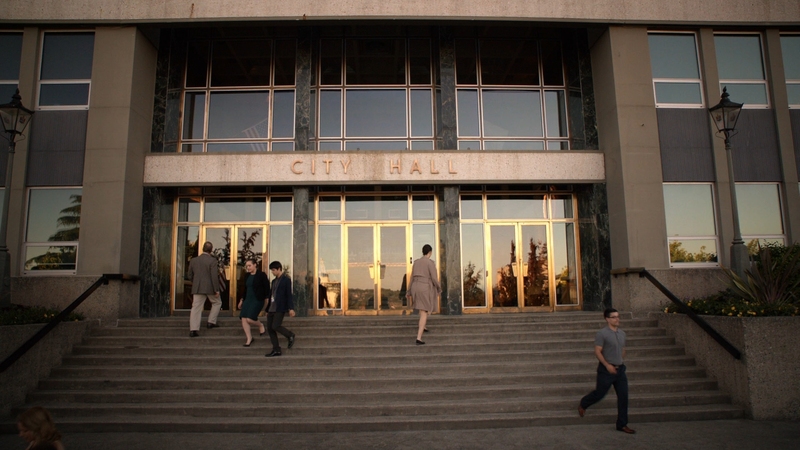 Mayor Queen faces impeachment, the FBI is investigating him for being the Green Arrow, and the police are on the payroll of the season’s villains. 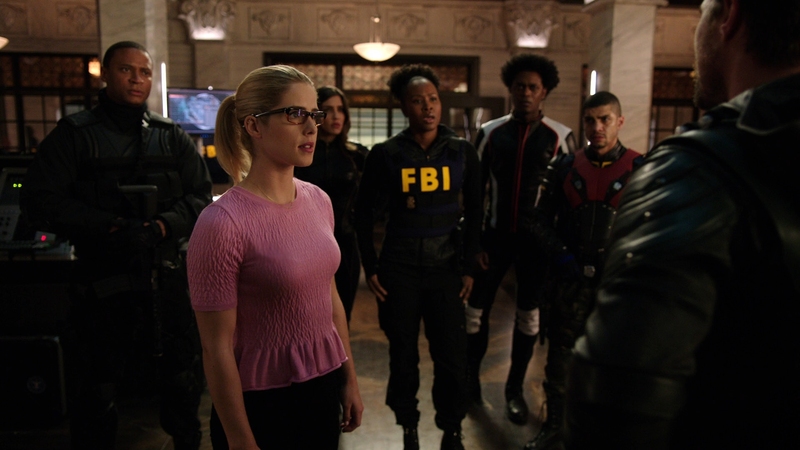 It’s possible the FBI exposes Queen as the Green Arrow in a season-long arc that will see someone on Team Arrow spilling everything to the Feds. The biggest happening of season six has to be the massive crossover between the various DC shows on the CW, called Crisis on Earth-X. Inspired by the comics where characters cross parallel earths all the time, it features evil Nazi versions of Supergirl and Green Arrow from a parallel dimension attempting to take over this Earth. Throwing all the stars from the CW together for a massive crossover is event television, and here it’s flawlessly pulled off. It doesn’t have a ton of implications for Arrow’s seasonal arc and can be enjoyed on its own terms. Most fans consider it the major highlight of season six. 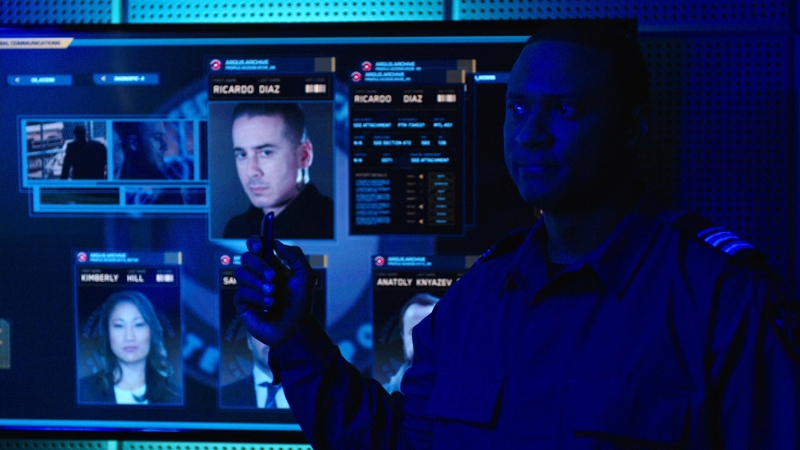 Enemies that pop up in season six include characters like Vigilante, Cayden James the super-hacker, Black Siren and Ricardo Diaz. The overarching theme of the season is that Oliver drives the people in his life away from him, including his own teammates and loved ones. The biggest conflict of season six for the Green Arrow is when Team Arrow splits apart, driven by Oliver’s distrust and controlling ways as team leader. The continued development of Dinah Drake (Juliana Harkavy) is a real strength for a show that always had problems with female characters. The good thing about season six is the lack of relationship drama between Oliver and Felicity. In fact, their relationship is the healthiest it has been since the early days of the show. Oliver may get in fights with everyone else, including Diggle, but Felicity is by his side for everything that goes down over the season. The return of Katie Cassidy is both a blessing and a curse to Arrow. Having played Laurel for four seasons before the character was killed off, it feels right that she returns to the show. Now playing Black Siren, an evil version of Laurel, her burgeoning daughter-like relationship with Captain Lance is awkward and mostly unbelievable. Captain Lance’s character is twisted in every direction to fit this new development. Most frustratingly, their little sub-plot is dragged out for most of the season. Something else should have been done with Black Siren. Season six of Arrow has its ups and downs but generally fits the tone of classic Arrow storytelling. Obviously there is some filler in a season this long. The return of Deathstroke is fantastic and the crossover with the other DC shows was some of the best television seen in 2017. It doesn’t match the fine-tuned storytelling of Arrow’s season two, or have an awesome villain like season five’s Adrian Chase, but this is another solid season of superhero adventures by Green Arrow and friends. Six seasons in, Arrow definitely has an established aesthetic fans of the show likely know. The 1.78:1 presentation in 1080P resolution largely mirrors the HD broadcast seen on the CW, but with better compression and slightly more clarity. Including the crossover episodes, all 26 episodes of season six are on four BD-50s. The video is encoded in AVC at sub-optimal bitrates. I will say that Warner’s newer compression encodings handle darker textures and poor visibility with far less artifacting than early seasons of Arrow on Blu-ray. There really isn’t much in the way of artifacts, even in fast-moving shots with lots of motion. 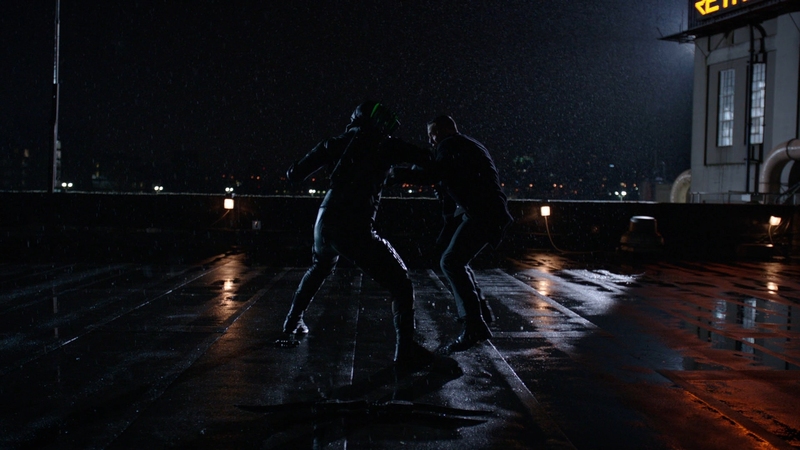 The picture itself has that slightly green palette used to highlight the Green Arrow’s costume when he battles villains. Clarity and definition are largely impeccable in interiors, albeit with lapses in sharpness and detail. Any hour-long drama that isn’t shot for HBO or another premium cable channel won’t have the picture-perfect cinematography often seen in Games of Thrones. Generally the show produces excellent, razor-sharp definition. Just don’t expect consistently perfect picture quality. 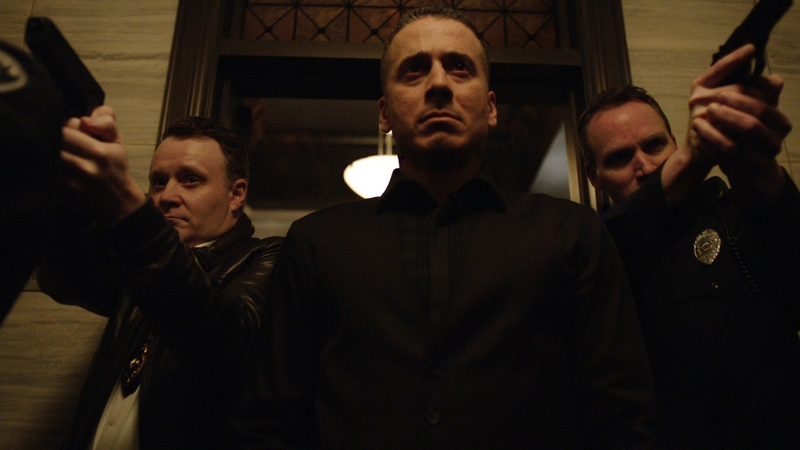 Arrow is a dark, moody series dimly lit in exteriors. This especially applies to any scene that has costumed heroes running around. 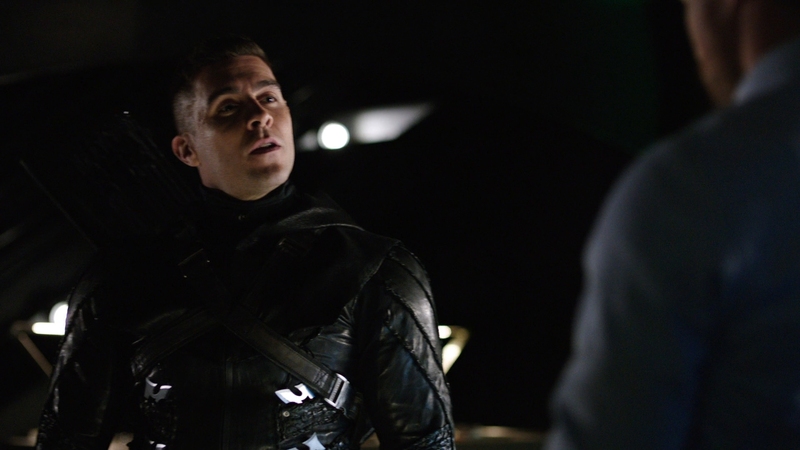 Arrow has always had the best-looking costumes among the superhero shows; it’s a shame they get shrouded in darkness so much. Arrow always had a lively soundtrack for a television series on the CW. It’s fundamentally an action show and almost every episode has multiple battles between costumed vigilantes. That leads to strong 5.1 DTS-HD MA audio with serious directionality and impact. Punches land with real weight throughout the soundstage, bolstered by a high-energy score that leaks into the surround channels. Arrow’s fans should know what to expect from this soundtrack. It has clean dialogue, strong audio design and excellent fidelity. Warner is always great about including multiple dubs and subtitle options. Optional subtitles include English SDH, French, Portuguese, Spanish, Danish, Finnish, Norwegian, and Swedish. Portuguese and Spanish dubs are included in Dolby Digital 2.0. Even some of the special features receive optional subtitles. The only things we can seemingly count on in life are death, taxes and Warner continuing their commitment to superhero television releases on Blu-ray. This sixth season of the popular CW series brings back most of the familiar special features of prior sets. The four-disc Blu-ray set comes in a larger-than-normal BD case, nestled inside an outer cardboard slipbox. Unlike some other seasons, there doesn’t appear to be any retailer exclusives for Arrow’s sixth season. We are on the final legs of UltraViolet as a viable digital sharing service with the advent of Movies Anywhere but WB thankfully includes a UV digital copy of the entire season one more time. Every episode of the season is given in HDX quality like always. These CW television sets are the last hold-out among Warner’s home video line that don’t include MA digital copies. That digital service has no way as of yet to tackle television content. A single insert has an episode guide running down the entire season. Gone are the deleted scenes and gag reels from prior season releases. The biggest boon to this set is the inclusion of all four episodes in the hyped Crisis On Earth-X crossover, including the episodes from fellow series Supergirl, The Flash, and DC’s Legends of Tomorrow. None of the episodes work on their own as a full story and it’s kind of Warner to include the crossover in its entirety on this set. The Best of DC TV’s Comic-Con Panels San Diego 2017 (58:27 in HD) – This is presented slightly different than prior seasonal sets. The panels from Supergirl, The Flash and Arrow are jumbled together in this one extended special feature. I guess it works as a form of cross-promotion for the other DC shows. Revenge In Ones and Zeroes: The Story of Cayden James (10:52 in HD) – This featurette examines the hacker character played by Lost’s Michael Emerson that rose to criminal mastermind in season six. 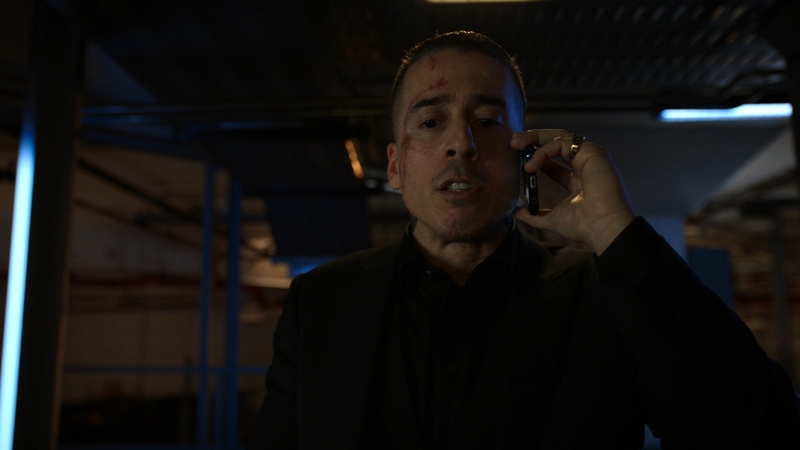 The Big Bad of season six for most of its first half, Emerson added his classy professionalism to the series. Inside the Crossover: Crisis On Earth-X (41:59 in HD) – The big event of the Fall sweeps period for the DC superhero shows on the CW, this extended look into the four episodes is rather detailed. If you are feeling lost or don’t keep up with all the other shows, this is a great introduction to everything it introduced. The Split of a Man: Deathstroke (11:48 in HD) – A featurette covering the return of Deathstroke, played by Manu Bennett. 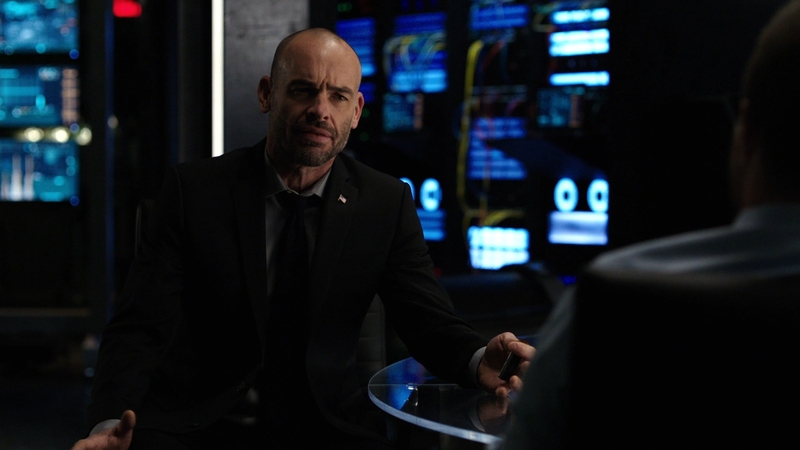 Always a fan-favorite character on Arrow, fans had been begging for his return and finally got it in season six for a brief stretch. More fine adventures from Green Arrow and team, this time dealing with conflict from within the team, threatens to bring Oliver down for good. The 15 unaltered images below have been taken directly from the Blu-ray. For an additional 13 Arrow: Season Six screenshots, early access to all screens (plus the 14,000+ already in our library) in full resolution, fifty exclusive 4K UHD reviews, and more, support us on Patreon.